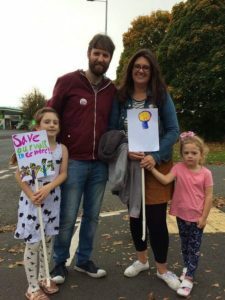 Dozens of Wirral residents marched from Eastham Clinic to Arrowe Park Hospital to highlight the distance many will have to travel if the proposed removal of walk-in services goes ahead. Wirral Clinical Commissioning Group is proposing to close many local centres and minor injury units across the peninsula, including clinics in Moreton, New Ferry, Eastham, Wallasey and Birkenhead. The new scheme aims to expand the walk-in centre at Arrowe Park Hospital. Sunday’s protest was designed to put the difficulties some will face into the spotlight, and Adam McNamara told JMU Journalism: “About 50 people started the walk in Eastham and about half of them finished. Eight miles is a long way to go on foot, on public transport or in a taxi, especially with kids or with a disability. “On a lot of days, I’d struggle to do it. Local walk-in centres provide a vital service,” the 35-year-old from Eastham added. Alan Grice, co-chairman of the Patient Participation Group, told JMU Journalism: “Thousands of people use the minor injuries and illness services across Wirral and I don’t think patients getting up to Arrowe Park is going to ease any pressure on A&E there. Patients across Wirral have expressed their concerns at the proposed loss of the local walk-in services. 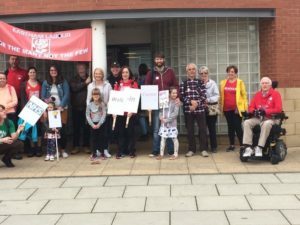 A petition with more than 3,800 signatures was presented at the full Wirral Council meeting last week and the councillors unanimously approved a motion to oppose the closures proposed by Wirral CCG. Consultation is set to end in December.